Always Be Closing – How? If you’ve ever had anything to do with sales, then you’re likely familiar with Alec Baldwin’s famous scene from the film, “Glen Gary, Glen Ross.” If you’re not familiar, and you haven’t seen it, just stop right now and watch it. Easily one of the best uses of seven minutes you’ll ever have in your life. Just click here. You’re welcome. In the scene, our dapper and dashing hero (who’s with us from Mitch & Murray) excoriates the all-star cast, extolling the virtues of ABC and AIDA. 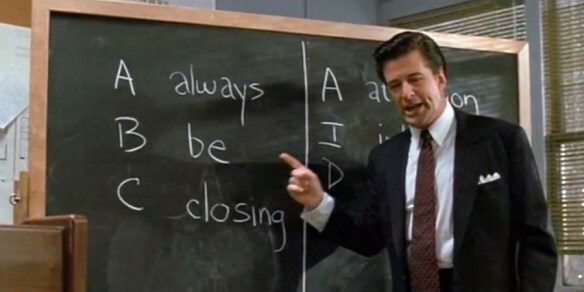 ABC, of course, is short hand for “Always Be Closing.” Closing, also being a salesman’s ultimate goal. Because Closing is where winning and losing happen. Closing is the final arbitrator: you either got the sale or you didn’t. You’ve gone all-in and the cards are turned up – did you make your flush? Most people avoid losing. Certainly more than they pursue winning. Given the choice, better to not really push it to a decision, right? I mean, if it’s going to happen, it’ll happen on its own, right? That’s garbage thinking. Everything we do speaks, as my illustrious co-worker told me recently. Everything we do should be in the service of doing our jobs, whatever they be, as well as we can. My job is chiefly focused on sales (55%) and more importantly, the success of the 15 sales people that report up to me. How do I help them execute like a black-hooded-hatchet-man? Closing means asking questions. It means caring enough about the client to want to solve their problem, even if the solution isn’t your product or service. It means valuing your clients’ time, attention, and trust. Closing is vowing to maximize each interaction, using every word and gesture to build a rapport so you can solve the mystery of what they need and how you can help them find it. If it happens to be your product/service, great! If not, that’s fine too! They’ve ostensibly come to you because you’re an expert and they’re in need of your knowledge – that’s a sacred trust and should be respected. 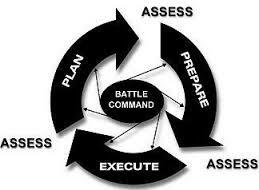 These are the things we need to breakdown for our teams. We need to get to the “WHY” of what we do. We need to make plain and clear that we’re here to solve problems, to solve mysteries, and to create relationships. Any person or team who can deliver those three things will find no shortage of success.